Our horse show management services are full service. We are proud of the team we have built over the years, and are pleased to offer a horse show experience that will please exhibitors, owners, and sponsors alike! 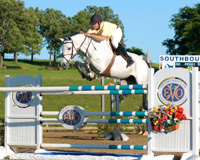 In addition to horse show management, Southbound offers a variety of other services. Please contact us directly to take advantage of these services! Take advantage of our time spent in developing an app that truly works for exhibitors and show management alike. We offer both a leasing option for the Southbound Showday app and customized personal app building services. Contact us for assistance with your communication needs! Rent a full color electronic scoreboard for your event of any kind! We can help you bring your event to life through colorful display of scores, times, sponsors, and show information. Contact us to secure your scoreboard rental dates! With decades of experience designing, building, and using jumps of all shapes and sizes, we can build any jump you can dream up! Examples of our work can be found in the photos throughout this website. Contact us for more photos or a design consultation for your custom jump needs!